In the last year, 27” 1440p displays went from being really high end in the monitor food chain to becoming close to commodity items that you buy off EBay for cheap from random vendors. It seems that there is a bit of a shift in the high-end display market, where previously resolution was dictating the upper echelon but now as we wait for 4K displays, or retina-style PPI displays on the desktop, it’s other features that are dictating what costs more. The newest reference display from Dell is the U3014, which takes the place of the U3011. It retains the same 2560x1600 resolution of a 30” display, but adds a few more notable features including DisplayPort MST support, USB 3.0 support, uniformity correction, and most notably it's one of the first LED-backlit displays with an AdobeRGB gamut. Looking only at the specs, this looks like a monitor aiming for the NEC and Eizo users out there, but does it reach those standards? The LED backlighting this is one of the most interesting things about the U3014. 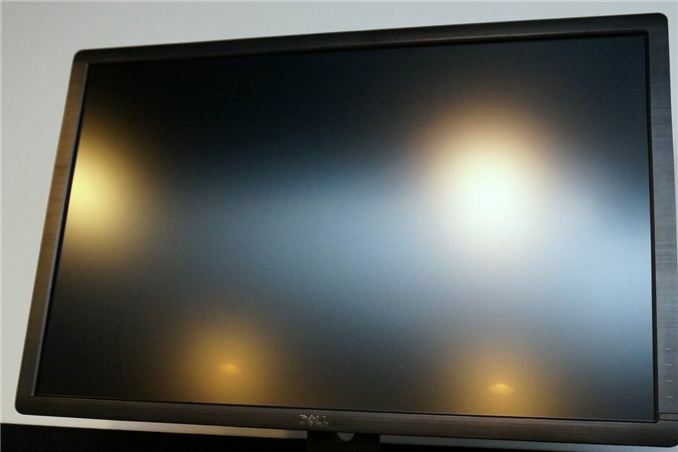 Traditional LED-backlit monitors use White LEDs, which only allow for an sRGB color gamut at maximum. Even then they often struggle to hit the full sRGB colorspace, making LED backlighting more about cabinet looks, and possibly energy use, than about performance. There have been a few exceptions like a Dell laptop and Samsung desktop LCD that used RGB LED backlighting, but typically despite the hype and marking around it LED lighting is usually not a sign of high performance in a monitor, and often it can be a sign of the opposite. The U3014 uses a GB-LED lighting system, where you have Green and Blue LEDs and a red phosphor that is excited by those LEDs to produce a much larger spectrum of light wavelengths, which allows for a larger color gamut. This article provides some more details and even talks about Quantum Dots, which Sony is starting to use on their TVs and you might see in a computer monitor at some point as well. To give another example of the wider gamut these can produce, here are the spectral signatures recorded in CalMAN using the Dell U3014 and the Nixeus VUE 27” and its standard White LEDs. Looking at these two charts (which are a bit confusing, I admit), we see that the level of blue output is similar from both, which we expect with LEDs. What you see on the Dell is a much higher level of green and red spectrum available, which is what allows for the larger color gamut to be used. Previously we’ve had to rely on CCFL lamps to do this larger gamut, but now with some LED tricks and a matching red phosphor, we can have LED illuminated displays that utilize a larger gamut. Of course you also have the assumption that more colors = better, right? Well, unfortunately that isn’t the case. If you only have a larger gamut and not software that understands how to use that gamut, what you get are colors that are further outside of the gamut than they should be. Greens are too green, reds are too red, and everything looks like a badly calibrated OLED smartphone. Anyone buying something like the U3014 is going to need to have accurate colors in any colorspace, and the Dell offers an sRGB mode as well. In addition to the preset sRGB and AdobeRGB modes, Dell offers two custom CAL1 and CAL2 modes that their calibration software can set to any gamut and white point you want. I will look at this in a moment and cover its performance. Hi. I'm the guy whose Dell forum post was quoted in the HOCP forum post. Dell don't want to know at all about this issue. It would be good if AnandTech could put some pressure on them about the hideous pixel overdrive they have set as default.